Just down the road from where the shuttle Atlantis is being prepped for flight, the U.S. Air Force launched its own unmanned reusable spaceplane to orbit aboard an Atlas 5 rocket Thursday evening on a round-trip shakedown mission. The military space shuttle does not carry a crew, but it relies on a laundry list of new technologies that Air Force officials hope will revolutionize how the Pentagon executes its space programs. "Fundamentally, this is an updated version of the space shuttle," said Gary Payton, the U.S. Air Force's top civilian leader for military space programs. "The Air Force has a suite of military missions in space. This new vehicle could potentially help us do those missions better." Built by Boeing Phantom Works, the 29-foot-long, 11,000-pound X-37B spacecraft sports a modest cargo bay, a powerful maneuvering engine, a deployable solar array, and stubby wings to guide the ship back to Earth after its mission. "Our top priority is demonstrating the vehicle itself," Payton said. "This has an autonomous flight control system, a new generation of silica tile, a wealth of other new technologies that are one generation beyond the shuttle." Although officials are openly discussing the X-37B platform itself, the Air Force is mum on exactly what payloads the unmanned ship carries inside its cargo hold, which is about the size of a pickup truck bed. "The actual on-orbit activities we do classify," Payton said earlier this week in a conference call with reporters. "We're doing that in this case for the actual experimental payloads that are on-orbit with the X-37." 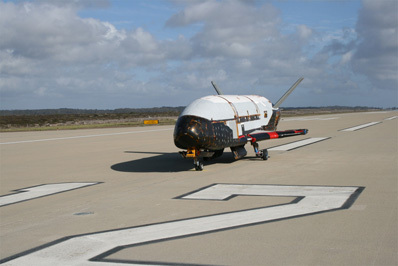 It will land on a runway originally built for the space shuttle at Vandenberg Air Force Base, Calif.
Officially named the Orbital Test Vehicle, the prototype spaceplane is about one-quarter the size of a space shuttle orbiter. "The Orbital Test Vehicle combines the best of aircraft and spacecraft to enable flexible and responsive missions," said Paul Rusnock, Boeing vice president of experimental systems and program director for the X-37B. "This first flight will demonstrate the readiness of the X-37B to begin serving the Air Force as it continues to investigate ways to make space access more routine, affordable and responsive." Besides saying the mission will demonstrate the craft's high-tech capabilities, the Air Force is not releasing any information on what experiments or objectives are planned while the X-37B is in orbit. The mission entered a news blackout less than 20 minutes after the 196-foot-tall Atlas 5 rocket blasted off at 7:52 p.m. EDT (2352 GMT) from Cape Canaveral, Fla. The Atlas 5 rocket launched in the 501 configuration with a 5.4-meter payload fairing, no solid rocket boosters and a single-engine Centaur upper stage. 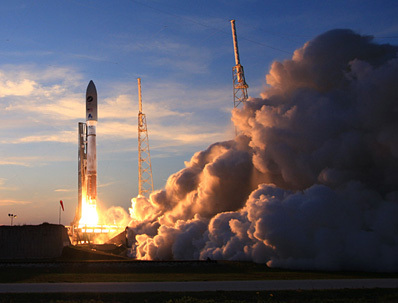 Thursday's launch was the first flight of that version of the Atlas 5, and it was the first time the rocket's larger payload shroud has flown since 2006. "This vehicle is light enough to launch without the solid rocket motors even with the larger fairing, making this a rather unique configuration," said Lt. Col. Erik Bowman, commander of the 45th Launch Support Squadron at Cape Canaveral. After flying vertically away from the launch pad at Complex 41, the Atlas 5's Russian-made main engine steered the rocket east from the Space Coast and into a clear blue sky awash with breathtaking sunset colors. Less than four minutes into the flight, the Atlas 5 rocket was already at the edge of space, high enough to jettison the 17-foot diameter nose cone cocooning the miniature space shuttle. The Atlas first stage pulled away from the Centaur upper stage four-and-a-half minutes after liftoff, and the hydrogen-fueled RL10 engine ignited on time about 10 seconds later. After firing for nearly 13 minutes, the Centaur shut down on schedule. The upper stage cut loose of the spaceplane about 20 minutes after liftoff. 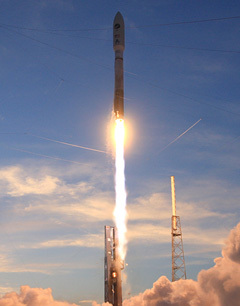 United Launch Alliance and Air Force officials say the launch was successful. The Air Force is not releasing the ship's planned orbit, but officials say it is designed to operate at altitudes between 110 and 500 nautical miles, or 126 to 575 statute miles. 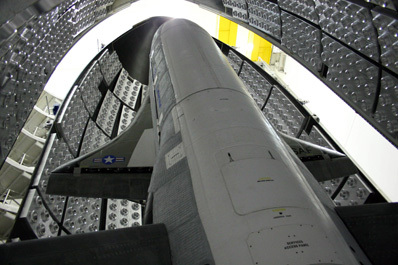 The X-37B's on-board engine is capable of significant maneuvers after the craft arrives in orbit. Once in space, the spaceplane was supposed to open its clamshell-like payload bay doors and unfurl its solar panel. During several weeks or months in orbit, the X-37B will be a testbed for secret new technologies. Future flights of the reusable spaceship could approach U.S. or foreign satellites, recover old spacecraft, or test out surveillance and repair techniques. The speculation leads some to voice concerns over the militarization of space. During a teleconference with reporters Tuesday, Payton said none of those activities are part of the X-37B's first flight. The craft launching Thursday does not carry a robot arm like the shuttle, and there are no rendezvous objectives planned for the mission, according to Payton. Officials hope this test flight will lead to more responsive space systems, including reusable vehicles like the X-37B. "If we're successful with this first launch, I would love to see us proliferate the X-37 idea and marry it up with Operationally Responsive Space," Payton said in a March interview. "We could have an X-37 sitting at Vandenberg or at the Cape, and on comparitively short notice, depending on warfighter requirements, we could put a specific payload into the payload bay, launch it up on an Atlas or Delta, and then have it stay in orbit, do the job for the combatant commander, and come back home. And then the next flight, we could have a different payload inside, maybe even for a different combatant commander." The Air Force does not plan to release any updates during the miniature shuttle's flight, but a cadre of dedicated satellite observers on the ground could track the spaceplane's orbit. The trackers may also see any objects deployed by the spacecraft. New heat shield technologies, advanced guidance and navigation, a solar power generation system, and new flight control systems are at the top of the list of public goals for the test flight. "The primary objectives of the X-37 are to [prove] a new batch of vehicle technologies for America's future, plus readying and demonstrating the concept of operations for reusable experimental payloads," Payton said. The X-37B will return to Earth only after it completes its top secret experiments in orbit. 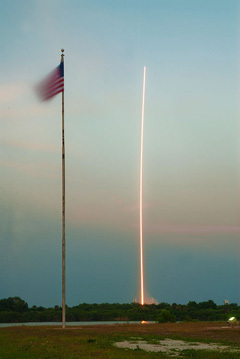 The mission will be controlled by the Air Force's 3rd Space Experimentation Squadron at Schriever Air Force Base, Colo. The length of the mission has not been determined, according to Payton. The craft can stay in orbit for up to 270 days. At the end of the flight, the craft's main engine will fire to drop the ship from orbit. The spaceplane will re-enter the atmosphere on a computer-controlled autopilot and make a high-speed landing at nearly 300 mph. "Our re-entry activity is slightly different than the shuttle because the real-time human control won't be there every single instance of de-orbit preps and de-orbit burn and entry," Payton said. "It will be relying on its own autopilot, its own gyroscopes, its own GPS receivers, eventually its own altimeter. It will be on its own all the way through entry and landing. And that's dramatically different than the way shuttle does it." A second spaceplane is under construction for launch some time next year. The Air Force will not set a specific launch date until the first X-37B safely returns. "The most important demonstration is on the ground," Payton said. "Once we get the bird back, we'll see what it really takes to turn this bird around and get it ready to go fly again, to learn how to do payload changeout on the ground, to learn how much it really costs to do this turnaround on the ground with these new technologies on the X-37 itself." The Air Force hopes turnaround times and operations expenses prove faster and less costly than traditional space platforms. "There is much to learn in the first few flights on the technologies used on this vehicle, how quickly it can be readied for a re-flight, and on the operational utility," said David Hamilton, director of the Air Force Rapid Capabilities Office. "We have started discussions with Air Force Space Command (officials) to plan for the possibility for transition to an operational capability, but the system first must prove its utility and cost effectiveness during the test program." In development for more than a decade, the X-37B craft builds on earlier design and testing by NASA and the Defense Advanced Research Projects Agency. The Air Force took over the program in 2006. The program's future, including the potential for operational sorties, hinges on the outcome of test flights in 2010 and 2011. "That all depends on the success of these first two birds," Payton said. "Can we keep the [operations and maintenance] costs low? Can we turn them around between flights easily?"